The Cyclades AlterPath OnBoard ATP8440 is a service processor manager that consolidates IP connections, user access and server health information while simplifying out-of-band management of next-generation servers with service processor technologies. With multiple Ethernet ports, the AlterPath OnBoard connects point-to-point with Ethernet-based service processors such as HP iLO, IPMI, Sun ALOM, Dell DRAC, IBM RSA and blade servers. By consolidating service processor Ethernet ports, the AlterPath OnBoard requires only one external IP address for all connected devices, reducing provisioning costs associated with service processors. The AlterPath OnBoard reduces costs even further by routing the service processor traffic through a less expensive out-of-band network that eliminates the use of switch ports on the production network. The AlterPath OnBoard ATP8440 offers a standard security schema for external access and providing proxy and conversion services to ensure that connected servers are isolated and protected from the external production network. The AlterPath OnBoard allows enterprise-class authentication, authorization and auditing (AAA) security and encryption, and extends this functionality to all servers. By providing a combination of proxy services, translation services, virtual private networks and dynamic access control, users are ensured a secure connection. Furthermore, the AlterPath OnBoard provides controlled access to services in each server's service processor after all authentication and authorization has taken place. 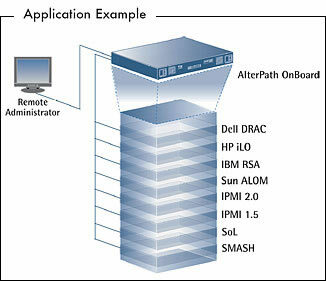 The AlterPath OnBoard ATP8440 provides a standardized feature set for out-of-band management of servers from multiple vendors by extracting the native service processor interface for configuration, KVM, console and power control, and displaying the information in an easy-to-understand format. Server administrators need only learn the simple AlterPath OnBoard interface and not other server management interfaces. The AlterPath OnBoard adds value by extending the functionality of service processors. Features such as data logging, event detection and notification, SNMP proxy, graphing and alarms for sensors and shared access to management ports are standard on the AlterPath OnBoard.